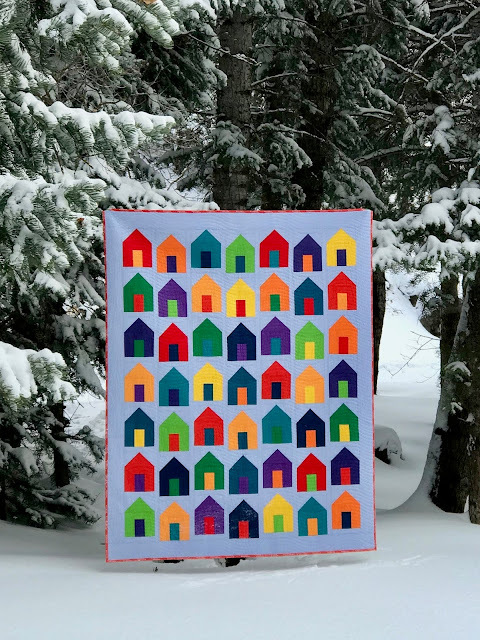 It was such a privilege to make this Dacha quilt for RJR's "What Shade Are You?" blog. Working with all of these bright fabrics was so much fun! Don't you just love the way that they stand out against the freshly fallen snow? You can find the original blog post HERE on the Quilt With Love blog. I've had several people ask me if I was going to make a pattern for this quilt. That wasn't my original plan, but I decided to throw together a quick tutorial, for those who might be interested in making something similar. 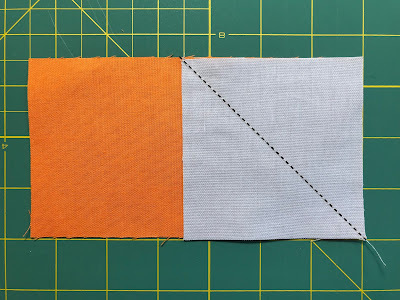 Although I love this quilt in solids, I can also imagine this as a scrappy quilt, so I'll give directions for an individual house block, and will also include basic guidelines for making the quilt as it is shown. One (1) - 3.5" x 6.5"
One (1) - 2" x 2.5"
Two (2) - 5.5" x 2.5"
One (1) - 4" x 2.5"
Two (2) - 3.5" x 3.5"
To make the roof, draw a diagonal line on the back of each background square. Sew on the line, as shown below. 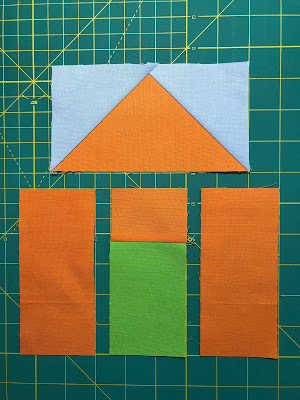 Press back to make sure your blocks is square, then trim. Repeat on the other side to make one flying geese...or is the one flying goose? Haha. Sew the small house piece to the top of the door piece. Assemble the block as shown below. Block size is 6" x 8" (finished). You will need 49 blocks to make the quilt as shown. It measures approximately 57" x 72". For this design, I selected the 12 house colors from primary, secondary, and tertiary colors of the color wheel, in deep saturated shades. I used RJR Cotton Supreme Solids, which are listed on the Quilt With Love blog. IMPORTANT: You will need 1/4 yard of each fabric. Please note that 1/4 yard will allow enough to make 4 houses. 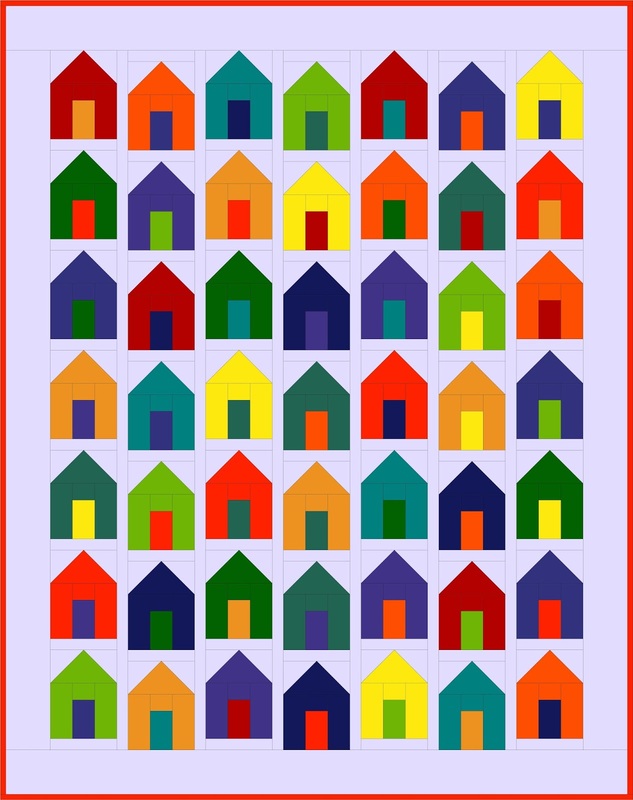 If you do the math, you'll realize that only gives you 48 houses, so make sure that you have a little extra of one of the colors to make the 49th house. 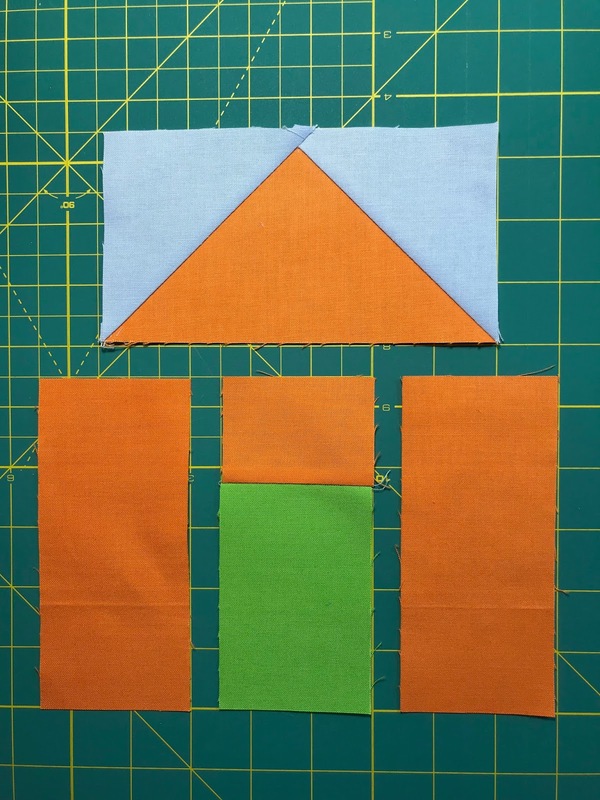 The cutting requirements for the house fabrics are pretty tight, so be mindful that you have a full nine (9) inches from which to cut. 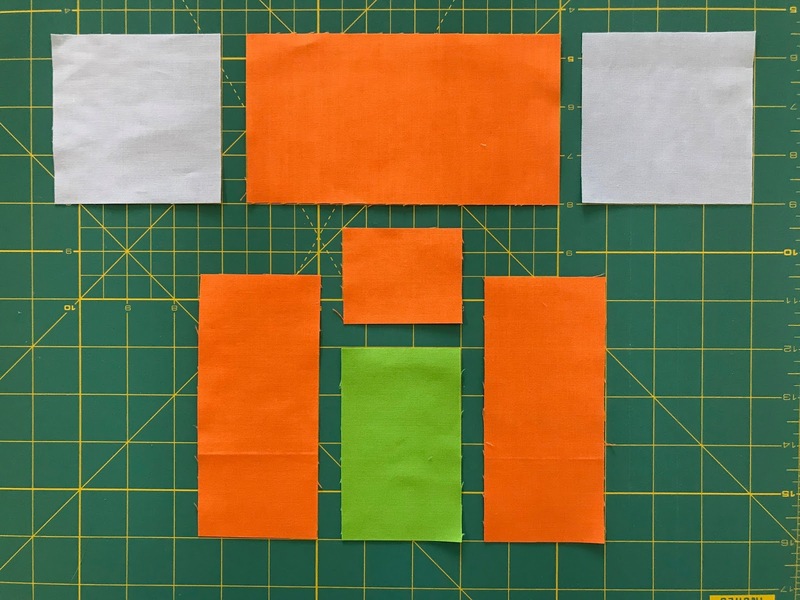 From each solid, cut the following. 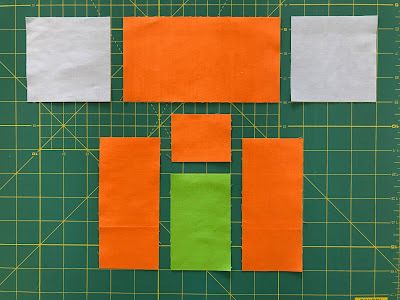 Note: you may be able to get by with only seven (7) cuts, if you use leftovers from the horizontal sashing. I hope that you find this tutorial helpful. 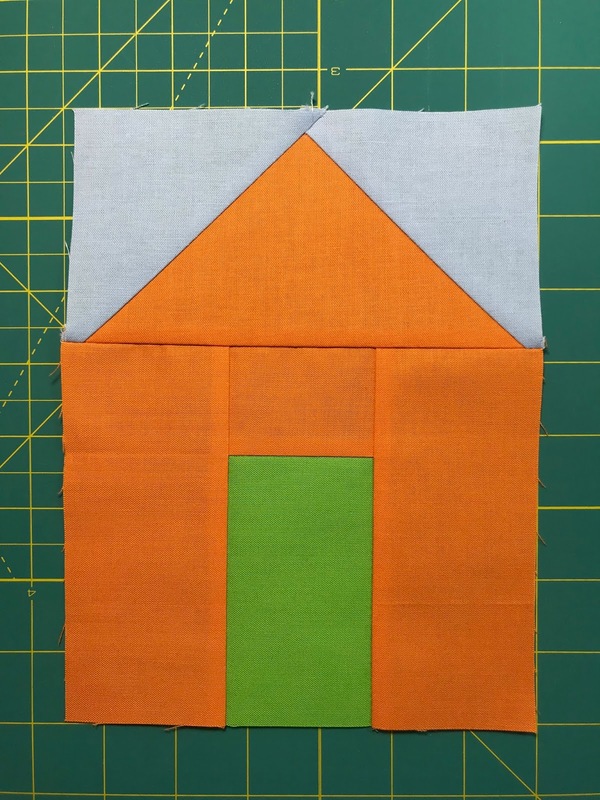 If you make your own Dacha quilt, please use the hashtag #dachaquilt and tag me on Instagram (@kairleoaks). I'd love to see your work! Quilted by Utah Valley Quilting. I love the picture of your quilt outside. ❤️❤️❤️ Super cute. Love your quilt! Love the tutorial! This is so stinkin'cute! Excellant directions. I was just admiring this on Friday(yesterday) and pouting about the dreary snow out side. What a great treat to find this tutorial today! Headed to see what I have in my stash to make a practice block. Thank you!!! I love the simplicity of it all. The color took center stage. Even my husband loved this quilt! Love all the colors, especially against the snow! Thanks for sharing your talent and creativity. I like your quilt and tutorial. The colors are so bright and colorful. And I think the way the rows are offset makes it even more interesting. Love it. Love your quilt!!! Thanks for the tutorial!!! ❤️😍❤️😍Colorful quilt and JUST PERFECT for ME!!! Great tutorial too! I definitely want to try making this one. 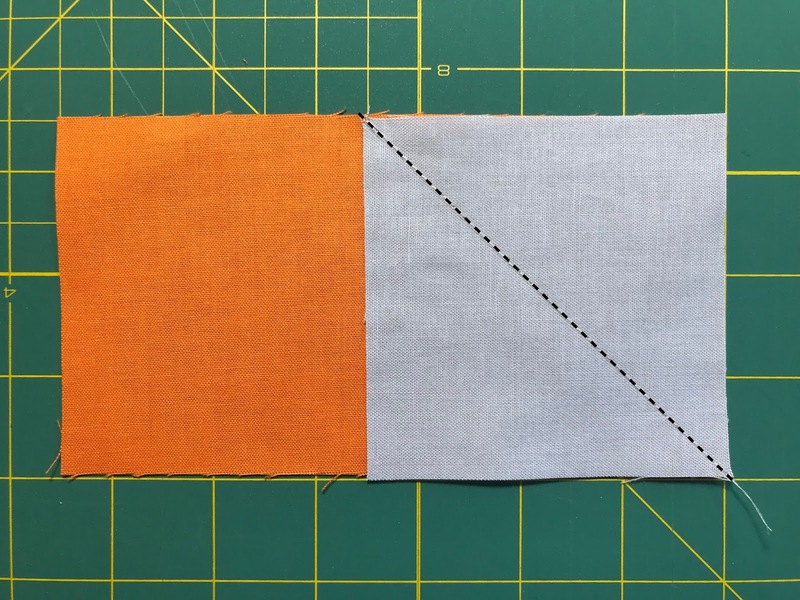 It's beautiful in solids, but you're right, it would make a really pretty scrappy quilt, too. Thank you for the tutorial! 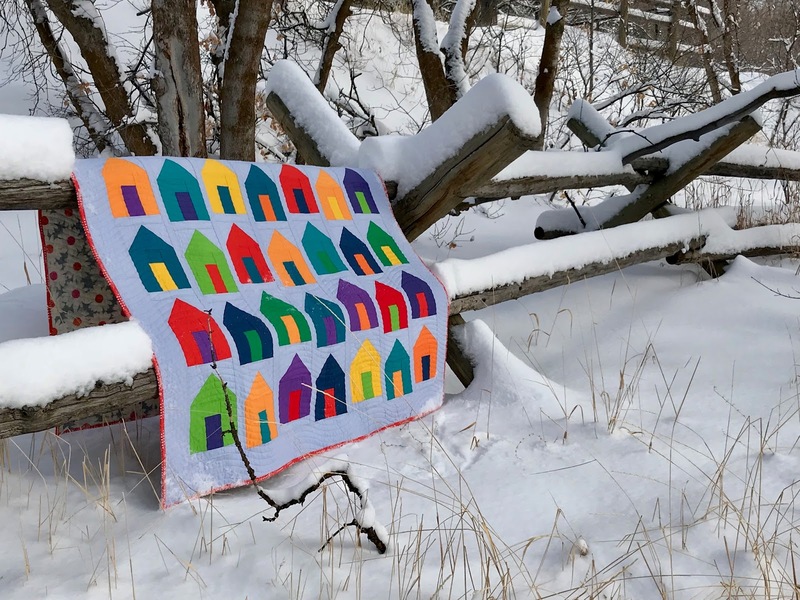 you made a happy quilt and took very nice pictures of it! Dacha Quilt :: What Shade Are You?